Whispers in the Loggia: Back Home, Among "Dear Friends"
A certain interreligious storm might be looming on the global stage, but it was nary in evidence in the Motor City earlier today as the latest high-profile appointee on these shores was warmly "prayed in" to his new post by a broad cadre of Christian, Jewish and Muslim leaders. 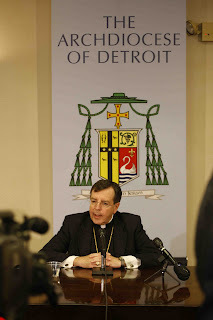 Five days after his installation, Archbishop Allen Vigneron of Detroit attended an interfaith breakfast in his honor at a local hotel where, among other things, an imam offered the opening prayer and a rabbi read from the Torah after a welcome from the city's mayor. The freshly-returned native son -- Benedict XVI's first appointee to one of US Catholicism's ten largest dioceses -- was introduced by his predecessor, Cardinal Adam Maida, who made building bridges across faith lines a hallmark of his almost two decades at the helm of the 1.5 million-member Motor City fold. As he departed the podium, Maida received a prolonged standing ovation of his own from the 100-plus religious and civic figures in attendance.